Ihor Olefirenko (born 1990) from Ukraine reached the finish line first in the Baku Marathon 2018. Mohammad Jafar Muradi (born 1990) from Iran came in second, while Omar Alkanoglu (born 1991) from Turkey ranked third. 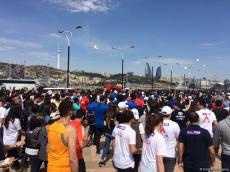 Baku Marathon 2018 was held May 13 under the auspices of the Heydar Aliyev Foundation. As many as 18,000 people participated in this marathon. Awards for the Baku Marathon 2018 will be granted in two categories: the first three places among men and women. Winners of the first places in both categories will be awarded 3,000 manats, whereas the second and third prize winners are to get 2,000 and 1,000 manats respectively along with gifts, medals and certificates. Besides, the winners of 4-10 places among men and women categories shall get various gifts from sponsors. Volunteers supporting the marathon and all participants will be awarded certificates by the organizers.